Bengaluru, 08 February, 2018: BYJU’S, India’s largest Ed-tech company and the most loved personalized K-12 app in the country has partnered with Cadbury Bournvita, one of India’s much loved Health Drink brands, to announce the launch of ‘Bournvita Scholar’ contest. 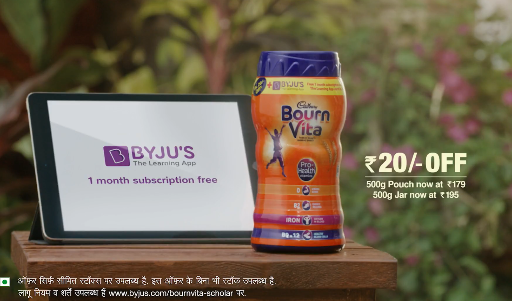 On the purchase of the promotional 500g pack of Cadbury Bournvita, students can now experience & benefit from the BYJU’S way of learning completely free for one whole month. Students who register on BYJU’S - The Learning App using the Bournvita code between February 1 and March 31, 2018 will also be eligible to participate in the ‘Bournvita Scholar’ contest. This contest will be in the form of a 60 minute online aptitude test. The link for this test will be shared with the students on their registered email ID. Top 200 students from all over India will win subscriptions to BYJU’S learning programs for one complete academic year. This two-month long campaign is in-line with the upcoming final exams, a time when students across grades chalk out their practice routines & get set for their final exam preparations. BYJU’S Learning programs are focused on conceptual clarity and a thorough understanding of every topic rather than rote memorization. Using data science and Technology the latest versions of the app personalises learning so that every student can learn at their pace and style. This association will help students be better prepared for their exams, and reduce stress and anxiety. Students can access the BYJU’S learning programs for free (for one month) simply by downloading the app and applying the code to access the free course. Mrinal Mohit, Chief Operating Officer, BYJU’S – The Learning App, said, “At BYJU’S our core focus is to help children learn better and we are thrilled to partner with Cadbury Bournvita for this initiative. Cadbury Bournvita is a household name that provides children with essential nutrients to help in their mental and physical development in the crucial years of growth. Assisting with children's learning, BYJU’S instils a curiosity to learn in children that can define how they learn throughout their lives. With both partners aiming at helping with the development of children, the ‘Bournvita Scholar’ initiative will push forward the importance of letting children grow on their own and become self-learners." BYJU’S is India’s largest Ed-tech company and the creator of India’s largest K-12 learning app which offers highly adaptive, engaging and effective learning programs for students in classes 4-12 (K-12) and competitive exams like JEE, NEET, CAT, IAS, GRE and GMAT. Launched in 2015, BYJU’s has become the most loved and preferred education app for students across age groups with 12 million users and 7,00,000 annual paid subscriptions. With an average time of 51 minutes being spent by a student on the app every day from 3000 cities and towns, the BYJU’S app is making learning enjoyable and effective. Annual renewal rates are as high as 90%.